● Aric Almirola started 11th, finished ninth, scoring two bonus points. ● The Smithfield driver joined the top-10 by lap six. ● On lap 72, Almirola pitted the No. 10 Ford under green-flag conditions for four tires and fuel. He came off pit road in 10th place. ● Almirola passed for ninth place before the stage ended after noting tight-handling conditions throughout the stage. ● At the conclusion of Stage 1, Almirola pitted for four fresh tires and fuel, and gained two additional spots on pit road. ● Started seventh, finished fifth, scoring six bonus points. ● Almirola drove the Smithfield Ford to sixth place by lap 179. ● He pitted the Smithfield Ford under green-flag conditions for four tires and fuel. He was scored in sixth when he rejoined the field. ● Almirola passed teammate Kurt Busch on lap 229 after battling for the fifth position since he left pit road. ● Almirola radioed crew chief Johnny Klausmier that the Smithfield Ford was too tight and needed adjusting at the end of the stage. ● When the stage concluded, he pitted for four tires, fuel and air pressure adjustments. After a quick pit stop he advanced to fourth place off of pit road. ● Started fourth and finished 13th. 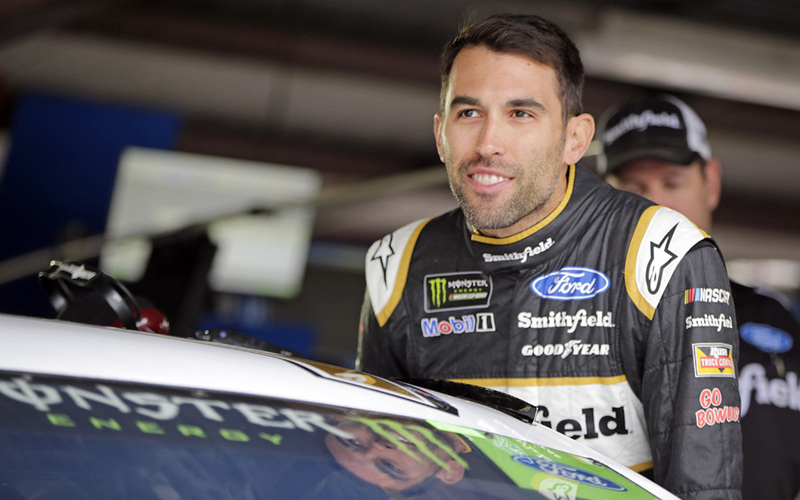 ● Almirola powered the Smithfield Ford to second place on the restart and held the position until he was passed by teammate Clint Bowyer on lap 302. ● At the time, Stewart-Haas Racing (SHR) had all four of its drivers in the top-four. ● Almirola took the second position back on lap 314 until he pitted under green for four tires and fuel. ● The Smithfield Ford driver took the lead when he exited pit road and stayed up front until a lap-338 caution. ● Almirola brought the No. 10 Ford to the pits for four tires and fuel. He exited pit road in second due to the No. 2 car only taking two tires. ● Almirola drove back to the lead on the restart and held the top spot until another caution was brought out on lap 338. ● He came to the pits under the caution for four tires and fuel. Several of the drivers behind him took two tires, demoting Almirola to the sixth position. ● During the restart, Almirola made contact with the wall and was involved in a multicar accident. He took the Smithfield Ford back to the pits to repair damage and finished 13th after the final two-lap shootout in overtime. ● This was Almirola’s 23rd top-20 of 2018 and his ninth top-20 in 13 career Monster Energy NASCAR Cup Series starts at Dover. ● Almirola finished ninth in Stage 1 to earn two bonus points and fifth in Stage 2 to earn an additional six bonus points. ● Almirola led twice for 64 laps – his first laps led at Dover. This was the second-highest total of the race. The next event on the Monster Energy NASCAR Cup Series schedule is the 1000Bulbs.com 500 on Sunday, Oct. 14 at Talladega (Ala.) Superspeedway. It is the fifth race of the 10-race playoffs and the second race for the Round of 12. It starts at 2 p.m. EDT on NBC with live prerace coverage provided by NBCSN beginning at noon.